Ahmedabad : Vijay Rupani has been named as the new Chief Minister for Gujarat by Bharatiya Janata Party (BJP). With this Amit Shah is looking forward to revive Party's image in the state by taking a chance of putting a leader who will have to come up with new policies to lure influential Patel community. It was believed that Nitin Patel would replace CM Anandiben Patel, but BJP surprised all with Vijay Rupani's name. # Vijay Rupani is the new Chief Minister for Gujarat. # This comes as a blow to Nitin Patel, who was one of the most favourite candidates for the post. 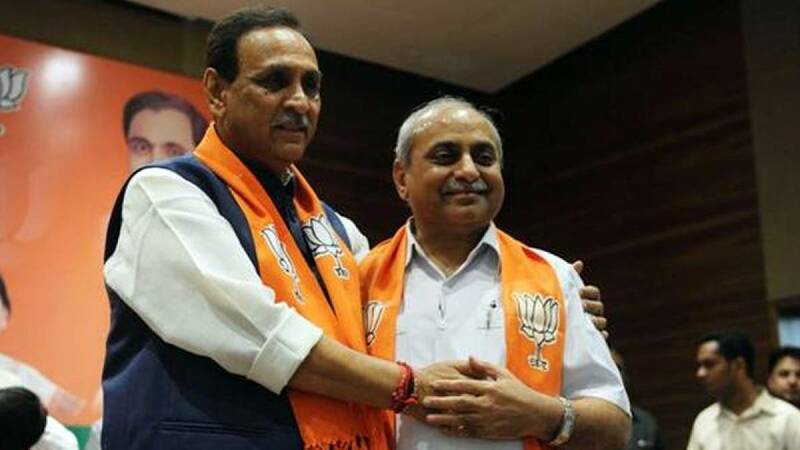 # Rupani scored more than Nitin Patel on the efficiency quotient: a vital consideration because of the recognition that the party will have to move with urgency to repair the damage suffered under Anandiben, who took over from Modi after his election as PM. # Couple of days back Anandiben offered her resignation citing her age of retirement as the reason. # With Rupani, Amit Shah has gained full authority over Gujarat and would be looking forward to revive PM Modi's image in the state. # Gujarat will go for polls in 2017. # Born on August 2, 2016, Vijay Rupani is a member of the Gujarat Legislative Assembly representing Rajkot West. # He has two children - One son, one daughter - from wife Anjali Rupani. # He has served in Ministry of transport, water supply, labor and employment. # He belongs to Jain community by religion.